December 24, 2014: Curve inversion will likely come more quickly than consensus assessment. Bail at 4:30. Hey Irwin! Festive Tidings to ya! Hello, got no picture for today? no, send me one. wasn't thinking. Irwin this is the jam! Heavy. Myrrh Christmas. Squirt! Was that anything like Wink, the grapefruit soda? Thanks to Laura Lindgren for the Squirty goodness. Yes, Squirt, like Wink, is grapefruit soda. Like Fresca, but sugar-sweetened. You are welcome. That there's from the Dr. Pepper Museum in Waco, Texas. I think Squirt was manufactured by Dr. Pepper, whose slogan was "Drink a bite to eat!" from the 1920s-60s. That Dr. Pepper is something! First with the soda, then the Lonely Hearts Club Band...wow! hope Fabio's not hearing this flute. Personally, I love it! Methinks you am riiiiiight, VP. Don't forget astrological sign and blood type. It's standard in Japanese friendship address books to include those too. They're still writing the code, Laura. I'll mention those two things. Good suggestion. If artist is dead, let's have cause of death too. For Andy Breckman can you also get a Birth: V or C on there too? Laura L: No idea what you are talking about, but I am a Gemini with A+ blood. So there you go! gluten free? vegan? details matter. Joe is quite UNmerry today, eh? Will the Old Codger be having a Squirt and Geritol before the show? Just tuned in, and this track goes well with my current mood. The Old Codger will be awash in Sly Weasel Bourbon. 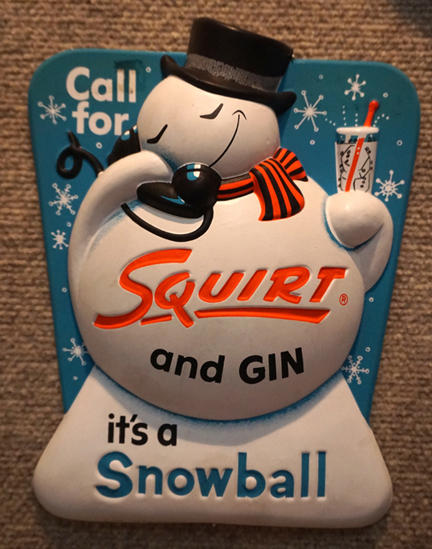 Squirt? as in the Mexican grapefruit soda ? Good to have some Diet Squirt around when you're counting calories. I believe at one time Hervé Villechaize was a spokesperson for Diet Squirt. thanks for all this irwin! Is the Android app acting strange for anyone? Mine goes to pause when I hit play. On all streams. I'll reboot it later and try again. my android app is fine in that respect. the android app is generally a POS though. Thanks Irwin! Great show! Safe travels and have fun, everyone! Hey common! Happy Zippy Zappy Yippy Yappy to you! Thank you for LISTENING. No fun with no audience (as Bryce will attest). Thanks, Irwin, and when you pass the microphone to him, tell the Old Codger not to overdo it with the Vitamin B! Thanks Irwin - always a pleasure!